We’re on our way to New Orleans. 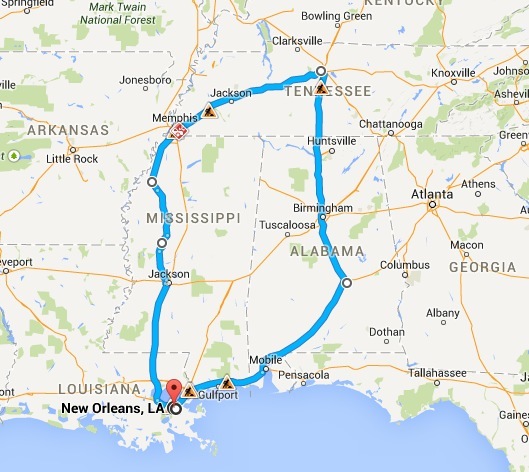 In fact, I’ve planned a road trip from New Orleans to Clarksdale (Mississippi) to Memphis to Nashville to Huntsville (Alabama) to Montgomery to New Orleans. We have only a week, so I’ve had to plan a schedule to make sure we can fit in all four states and everything I want to see. It will be a week full of music and food and swamps and Elvis and space exploration and civil rights history. It’s going to be busy. I think we’ll need a holiday when we get back.